Earlier this month we launched our first ‘On the Go’ (OTG) USB Flash Drives, the Orbit and the Lynx. These two new additions to our Memory product range are our most innovative and functional USB Flash Drives yet. 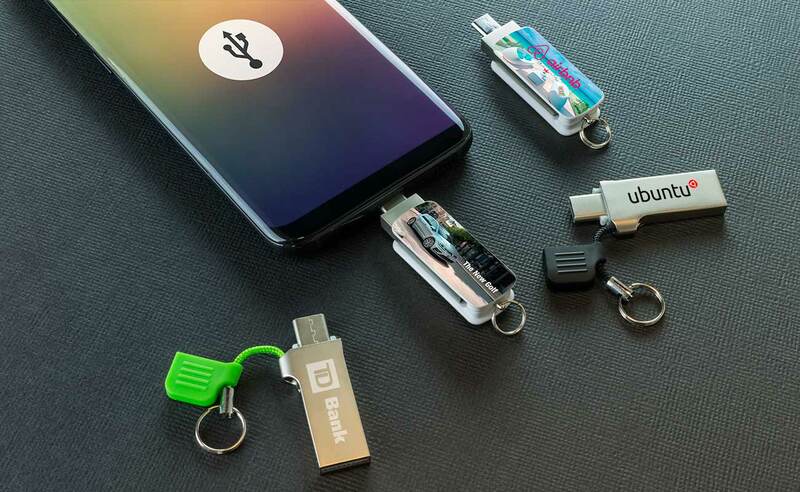 OTG USB Flash Drives are double-ended USB Flash Drives, with a standard USB Type-A connector at one end and either a Micro-B or Type C connector at the other. This allows them to be connected to mobile devices such as smartphones and tablets, which act as a host, allowing other USB devices to be attached to them. As with standard USB Flash Drives, the OTG USB Flash Drive can serve as an external storage device, offering increased data capacity for smartphones and tablets, on a simple and portable unit. This is the most common use of the OTG USB Flash Drive. Video controllers can be connected to your mobile device, effectively turning your smartphone or tablet into a portable games console. Should you want to use your mobile device as a laptop, you can connect a keyboard and/or mouse for a more convenient typing solution. Similarly to the keyboards and mice, you can connect your smartphone or tablet to a printer and print any photos and documents from your device as necessary. Another popular use of the OTG USB is to connect a digital camera, and use your mobile device as a giant livescreen, complete with the ability to capture, focus, control shutter speed, and much more. If you would like to know more about our OTG USB Flash Drives, or any other products in our Memory, Audio or Power range, please fill out our Quick Quote Form and a dedicated Account Manager will be in touch as soon as possible.